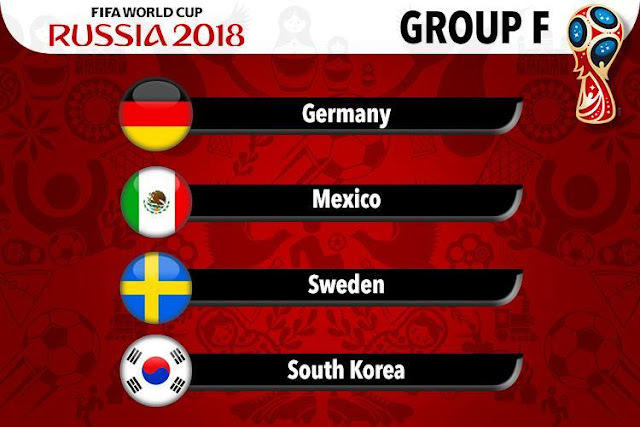 Check out confirmed details about Group F Teams, Schedule, Predictions for the upcoming 2018 FIFA World Cup in Russia. Defending world cup and confederation cup champions Germany is one of the team which is expected to win the world cup. Their worst FIFA ranking after winning the world cup was fourth. This shows how consistent this team is! North American nation Mexico is one of the strongest team in their confederation. But since 1994 they have not advanced further round of 16. Mexico will want to forgive their previous records and improve their performance. After failing to qualify for the 2010 and 2014 world cup, Sweden will be making their twelfth appearance. They would want to inspire themselves from 1958 world cup where they reached the final but failed to win it. 2015 AFC Asian cup runner ups South Korea has been able to qualify for the tournament, extending their consecutive participation record since 1986. When they hosted the 2002 world cup, they were able to enter into semi finals be defeating Italy. It is never in doubt that Germany would top this group. After winning the FIFA world cup in 2014, the team did not look back and entered the semi finals of European cup in 2016, won the Confederation Cup in 2017 and even won all 10 out of 10 matches in qualifying stage. Germany would create a tough competition for other teams for the remaining qualifying spot. While Mexico lost only one game through the qualifying campaign, Sweden bounced back in second round after defeating 2006 world champions Italy by one goal to nil on aggregate. Mexico entered the semi final of 2017 continental cup but Sweden was eliminated in group stage itself. So the fight for the second spot qualification can be dependent very much on this game. But still the 2015 AFC Asian cup runner ups South Korea would want to make notice their presence. They would be keen to have a say in this matter of qualification.